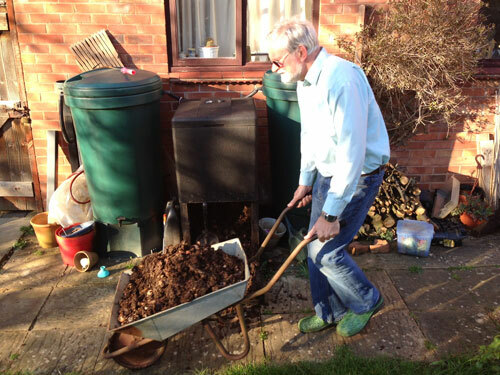 "The compost I have generated is really good stuff and has done wonders for my onion growing." I have used a Hot Compost Bin for around five and a half years and have found it to be a very quick and effective method for producing high quality compost from kitchen and garden waste. I use the compost produced to grow vegetables in two 8ft by 4ft raised beds. After five and half years of use including a couple of cold winters and a very warm summer, the bin is still in very good condition and ready to be filled again having been cleaned out followed the removal of the last batch of compost. As the bin fills the food waste decomposes giving off heat which is kept in the bin by the thick insulating walls. It is important to add a sprinkling of bulking agent from time to time so to provide the correct mix of materials. The temperature can be monitored by a thermometer in the lid of the bin and another one which can be inserted into the decomposing waste. The temperature can be adjusted accordingly using a vent in the top of the bin. The food waste rapidly composts down. I have detected little or no smell and is easy to empty from the bottom of the bin following the removal of the bottom panel. The compost I have generated is really good stuff and has done wonders for my onion growing, its looks really rich, is nice and dense and smells earthy like compost should.